The Municipality of Yerevan has agreed to allow Liberty Square in the capital’s center to again be used for public demonstration – a move that is being met by the Armenian National Congress (ANC), the largest opposition faction in Armenia, as acquiescence to demands from ex-president Levon Ter-Petrosyan at previous demonstrations. ANC had been denied more than 100 times its requests to assemble on the grounds since civil unrest began there March 1, 2008, leading to 10 deaths. At the latest two rallies, on March 17 and April 8 protestors were met by a ring of police that stood down after telephone discussions with authorities and protest leaders. On April 8, Ter-Petrosyan listed lifting of the de-facto ban on political gatherings in Liberty Square as one of the three main preconditions to the government for starting a political dialogue. The other two conditions included the release of all jailed opposition activists and a pledge of a comprehensive probe into the 2008 post-election unrest and the circumstances of its ten deaths, in particular. Earlier this month, President Serzh Sargsyan told his top security and law-enforcement officials that he expected “a new impetus” in the March 1, 2008 investigation and urged them to try and find “new ways of disclosing the crime”. The statement led analysts to speculate on an emerging dialogue between the ANC and the government. 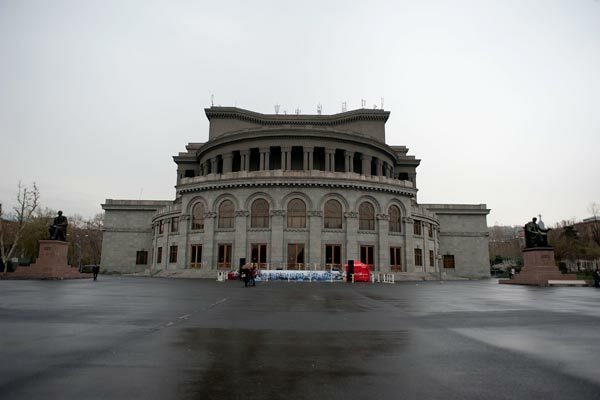 In a statement released on Tuesday, the ANC congratulated all its members on the Yerevan municipality’s move and announced that it had re-appointed its rally on April 28 from the area near the ancient manuscripts depository Matenadaran to nearby Liberty Square. “The square that symbolizes the conception of free speech, liberty and independence from now on will serve the cause of disseminating free speech, gaining genuine freedom and strengthening the independence of Armenia,” the ANC underscored.